https://sep.yimg.com/ay/yhst-33477391359232/bubble-tip-brittle-fancy-sea-star-ophiarachna-species-fancy-brittle-6.jpgBubble Tip Brittle Fancy Sea Star - Ophiarachna species - Fancy Brittle Expert Only!!! Taxonomy: Bubble Tip Brittle Fancy Sea Star belongs to the Kingdom Animalia, Phylum Echinodermata, Class Ophiuroidea, Family Ophiotrichidae and Genus Ophiarachna. 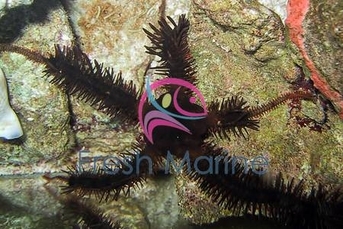 Scientific names: The scientific name of Bubble Tip Brittle Fancy Sea Star is Ophiarachna species. Other common names: Bubble Tip Brittle Fancy Sea Star is also commonly known as Fancy Brittle. Origin or natural range: The Ophiarachna species originates from the Indo-Pacific region including Fiji. Size: Bubble Tip Brittle Fancy Sea Star may grow up to a size of approximately ten inches. Color: The Ophiarachna species occurs in Green, Brown and Tan colors. Aggression: Bubble Tip Brittle Fancy Sea Star is semi-aggressive towards the marine aquarium invertebrates. Compatibility: The Ophiarachna species is reef compatible. Venom status: Bubble Tip Brittle Fancy Sea Star is non-poisonous in nature. In its natural habitat, The Ophiarachna species is found in groups on shallow reefs. Bubble Tip Brittle Fancy Sea Star is Nocturnal in nature and hides away during the day time under rocks or in rock caves or on sessile marine invertebrates, while being active at night. The Ophiarachna species is quite agile in its rounded, wavy movement. Bubble Tip Brittle Fancy Sea Star is quite brittle and breaks off readily. Hardiness: The Ophiarachna species is very Hardy. The tips of the arms and the delicate body of Bubble Tip Brittle Fancy Sea Star have bubble shaped projections and therefore the common name. The Ophiarachna species has a very small central disc which is Olive Green in color and is patterned in Black and White colors. Bubble Tip Brittle Fancy Sea Star has five long and spiny, yellow colored arms with white or black colored hairy filaments lining along the edges of each of the five arms. The arms of The Ophiarachna species function chiefly as sensory organs rather than feeding tools. Tank type: To host Bubble Tip Brittle Fancy Sea Star, you should have a Reef Type Marine Aquarium. Acclimation: Slowly acclimate Bubble Tip Brittle Fancy Sea Star to your marine aquarium environment through Slow Drip method. The slow acclimation process takes a minimum time period of two hours. Diet: The Ophiarachna species is Carnivorous in its feeding habit. Food content: Bubble Tip Brittle Fancy Sea Star eats detritus, zooplankton, phytoplankton and the meaty bits of seafood and small fish. Supplements: Supplement the diet of the Ophiarachna species with the frozen meaty bits of Raw Shrimp, Scallop, Mussels and Clams to name some. You can directly hand feed Bubble Tip Brittle Fancy Sea Star. The Ophiarachna species eats detritus and therefore, keeps your marine aquarium free of any perishable organic waste matter. Bubble Tip Brittle Fancy Sea Star searches for its food in sand of your reef tank and ploughs the sand in the process, thereby aerating it well. Bubble Tip Brittle Fancy Sea Star is easy to maintain. Sudden fluctuations in temperature, pH, Oxygen level and/or the specific gravity of water in your marine aquarium may prove adverse for the health of the Ophiarachna species therein. Copper and Nitrates in any form in your reef tank may prove lethal for Bubble Tip Brittle Fancy Sea Star in it. Aquarist�s level: Even beginner aquarists can handle and maintain Bubble Tip Brittle Fancy Sea Star. Caution: If not fed properly, the Ophiarachna species may eat small fish in your marine aquarium. Therefore, feed the sea star properly and regularly to keep it calm.